Pamlico Deli is a family-run market and deli with a legacy dating back to 1910. The original business, Blaskovics Meat Market, was founded in Milwaukee, Wisconsin by Emil and Antonia Blaskovics, a Yugoslavian immigrant family. Emil wanted to open a bar, but Antonia said no... “people gotta eat”. Although the original business closed in the early 1980’s, Pamlico Deli in Frisco, NC was founded as an extension of the family business. At Pamlico Deli, we pride ourselves on high-quality ingredients and delicious family recipes. Like our food, our interior was built with love and soul in order to provide a positive atmosphere and encourage conversation. We also strive to be be eco-friendly both in our home and in our deli. 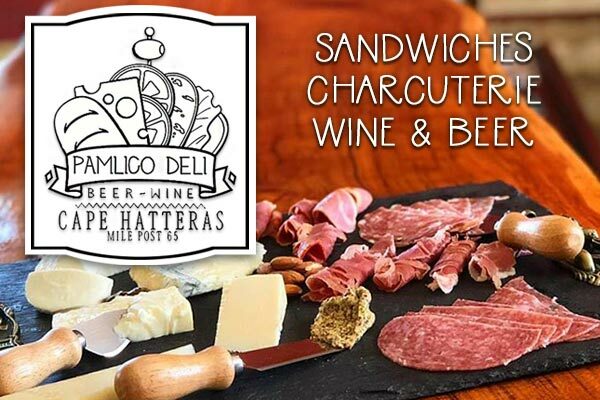 In the evenings, Pamlico Deli offers a variety of meat and cheese platters known as charcuterie boards, which can be customized to your taste and paired with your favorite wines. Looking for an easy dinner? Choose from a selection of pans to go including lasagna, manicotti, meatballs and much more. We also offer wine tastings, live music and a selection of beer and wine. Whether you're looking for a great sandwich for the beach, a meat and cheese board for date night or just a glass of wine and good conversation, we have you covered! We look forward to serving you at Pamlico Deli on Hatteras Island.